Scientific workflows are often data intensive. The data sets obtained by enacting scientific workflows have several applications, e.g., they can be used to identify data correlations or to understand phenomena, and therefore are worth storing in repositories for future analyzes. Our experience suggests that such datasets often contain duplicate records. Indeed, scientists tend to enact the same workflow multiple times using the same or overlapping datasets, which gives rise to duplicates in workflow results. The presence of duplicates may increase the complexity of workflow results interpretation and analyzes. Moreover, it unnecessarily increases the size of datasets within workflow results repositories. 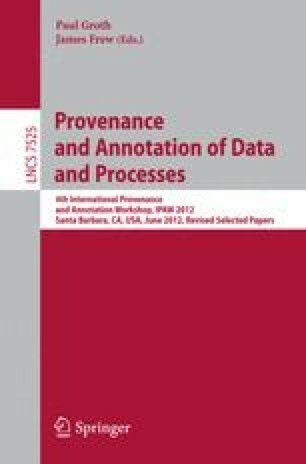 In this paper, we present an approach whereby duplicates detection is guided by workflow provenance trace. The hypothesis that we explore and exploit is that the operations that compose a workflow are likely to produce the same (or overlapping) dataset given the same (or overlapping) dataset. A preliminary analytic and empirical validation shows the effectiveness and applicability of the method proposed.